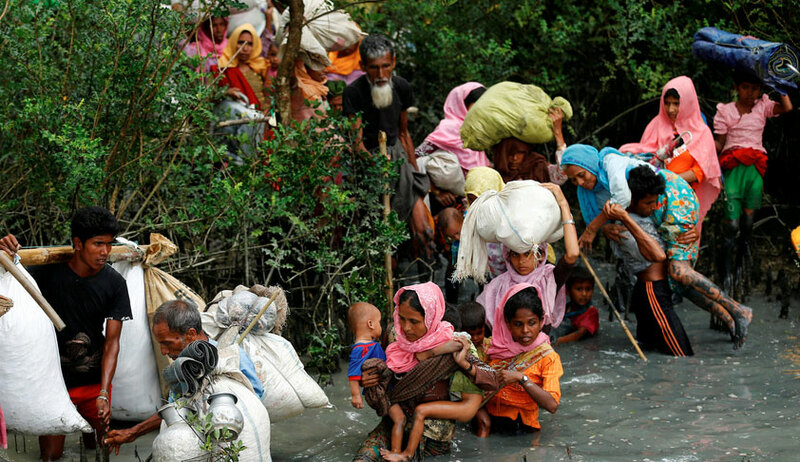 The Supreme Court today sought the response of the Centre on a new application filed by noted lawyer Prashant Bhushan seeking a direction to the government not to prevent more Rohingya muslims from entering India by crossing the Myanmar border. Bhushan also wanted better living conditions for Rohingyas present in India. Bhushan appears for Mohammad Salimullah and Mohammad Shaqir, the main petitioners who have challenged the Centre’s move to deport the Rohingya muslims back to Myanmar. Appearing for the Centre, Additional Solicitor General Tushar Mehta challenged Bhushan’s new demand and asked him “Do you want India to become a refugee capital? If this argument is accepted, it would soon turn out to be”. But he sought time to file response to the application. “Ideally the court should not interfere in these issues at all .These issues shall be decided diplomatically at an executive level. Because these are executive decisions and courts should not interfere”, Mehta argued. Justice D Y Chandrachud intervened to say that Principle of ‘Non- Refoulment’ prohibits the deportation of refugees to a country where they face threat to their life or persecution and said “To my view it applies only to those who are already here and not who are willing to come in”. Bhushan replied that “pushing back is also a violation of principle of non-refoulment..Somebody is being threatened with genocide”. Justice Chandrachud said ‘welcome’ word may be an exaggeration but there is an existing policy decision to the effect. Bhushan’s plea against deportation of Rohingya refugees got a shot in the arm when the NHRC represented by senior advocate Gopal Subramanium supported protection of rights of Rohingya Refugees in India including access of their children to schools and other facilities Subramanium said the refugees have a right to approach Supreme Court for securing their basic rights like education and health care as well as security. The bench had on October 13 just stopped short of staying the deportation of Rohigya refugees till it decided the petitions challenging the action but asked the Centre to strike a balance between national security and human rights of the refugees. “Our constitutional ethos makes us lean sympathetically towards humanitarian issues. It is also important not to ignore national and economic interests while dealing with humanitarian issues”, CJI Misra had told ASG Tushar Mehta adding the court and also government cannot be oblivious of the plight of interest of children and women. At one stage the bench observed that till the matter is being heard by the court, there should not be any deportation of the refugees. However the Additional Solicitor General strenuously objected to any such order by the court, saying that it would embarrass the government in the international fora. The court therefore ultimately passed an order saying that in case there is any contingency, the petitioners would be at liberty to approach the court. Senior lawyer, the legendary Fali S Nariman arguing for the Rohingya community had pointed out the Protection of Human Rights Act defines human rights to include not merely fundamental rights or rights under the Indian law but human rights arising out of international conventions to which India is a party. He also pointed out that the fundamental right to life and liberty under article 21 applies not only to citizens but also to non citizens. Nariman had observed that the government can’t speak in two voices – one in the UN and international fora and another totally opposite in India and before this court. India’s stated policy position in International fora and as mentioned throughout in policy statements and notifications, has been to recognise the distinction between refugees who are forced out for their countries due to persecution and illegal migrants who come in search of economic prospects, he said. After hearing this the court observed that, there are two important considerations in this case - the aspect of security of the country and the protection of human rights of refugees particularly women, children, old persons and innocent persons and that the court has to balance these interests.